Manchester City are well represented in Marca’s list of Top 100 Players of 2018 despite a couple of notable absences. The Spanish newspaper has released its annual list of what its experts believe to have been the 100 best performing players of the year just passed, and there are nine from City’s record-breaking side in there. 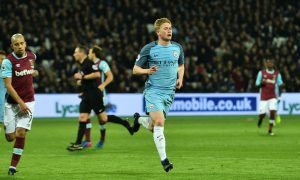 Conspicuous by their absence are Aymeric Laporte and the forever underrated Fernandinho, but Kevin De Bruyne was ranked in 10th spot, the highest of any City player. Kun Agüero was next among the City players in 19th, followed by Raheem Sterling in 26th and his fellow wing wizard Leroy Sané in 35th. Spanish favourite David Silva finished 42nd a little ahead of namesake Bernardo Silva who came in 47th, with John Stones recognised for a fine year in the 57th spot, just ahead of England teammate Kyle Walker in 59th. The final City player ranked was Brazilian striker Gabriel Jesus, who finished 67th.